As America welcomes a new President, visitors to New York State can walk in the footsteps of some of the former Empire State residents and natives who have held the country’s highest office. New York State is the birthplace of four U.S. presidents and has served as home to a number of others throughout history. Explore the New York State family homes, summer getaways and final resting places of former Commanders in Chief. Visitors to Franklin Delano Roosevelt’s home, Springwood, can view a film showcasing the history of the 32nd president’s home and life. The tour of Springwood includes the home itself, the Roosevelt Museum and Library and the presidential cemetery where FDR and Eleanor Roosevelt are buried. (845/229-9115). Martin Van Buren was born and raised on his father’s New York farm. Lindenwald, The Martin Van Buren National Historical mansion in Kinderhook Village was purchased by Van Buren after he completed his term as president. He lived here for the next 20 years until his death. (518/758-9689). Sagamore Hill National Historic Site at Oyster Bay, NY was the adult home of Theodore Roosevelt. The home served as the summer White House where the Roosevelts worked, played and conducted affairs of state hosting a variety of political dignitaries. Walk along the nature trail and beach paths, the same paths used by the Roosevelts and their friends. (516/922-4788). 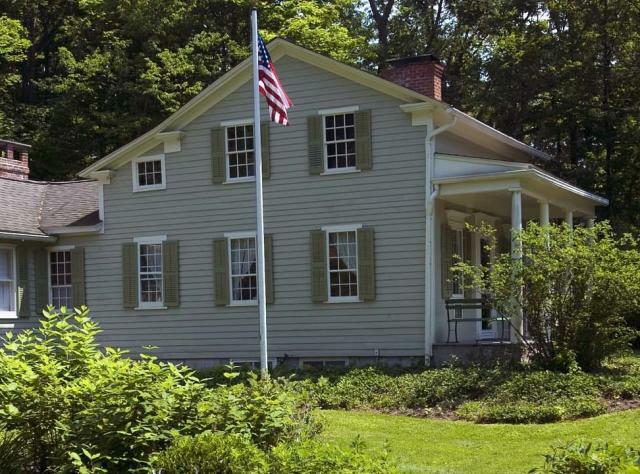 Born in a log cabin in the Finger Lakes, Millard Fillmore’s only other residence became the White House. A replica of Fillmore’s birthplace can be found at Fillmore Glen State Park. The park is open to the public and includes activities such as hunting, hiking, snowmobiling and cross-country skiing. (315/497-3494). An Adirondack cottage located in Mount McGregor is where Ulysses S. Grant spent the last month of his life writing his memoirs and completing the last page just a few days before his death. The cottage remains essentially the same as during the Grant family’s stay, with original furnishings, personal items and even the bed where he died. (518/587-8277). Before they were elected, Presidents Lincoln, Grant, Cleveland, Taft, Theodore Roosevelt and Barack Obama all spoke in Cooper Union&apos;s celebrated auditorium. Abraham Lincoln gave his "Right Makes Might" speech from the Great Hall podium, assuring him the presidency. Incumbents Woodrow Wilson and Bill Clinton also spoke there. (212/353-4100). Washington Headquarters is the nation&apos;s first publicly owned historic site. Guests to the headquarters can tour the rooms where American history was made. In the critical months that General George Washington spent at Newburgh, he made some of his most important contributions to shaping the American republic. (518/474-0456). White Pine Camp served as the summer White House for Calvin Coolidge. Known as one of the Adirondack Park&apos;s most outstanding "Great Camps," rustic yet elegant retreats built by wealthy families at the turn of the century, the camp is now a museum and available for overnight lodging. (518/327-3030).